Lauren B. Resnick is an internationally known scholar who has made exceptional contributions to the cognitive science of learning and instruction. She has served as director of the prestigious Learning Research and Development Center and is founder and director of the Institute for Learning, both at the University of Pittsburgh, where she is a Distinguished University Professor of Psychology and Cognitive Science and of Learning Sciences and Education Policy. Educated at Radcliffe and Harvard, Dr. Resnick has been an Overseer of Harvard University and a member of the Smithsonian Council. In 1986-1987, she was the president of the American Educational Research Association (AERA). 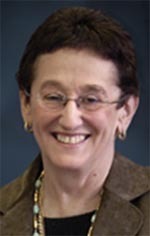 Dr. Resnick has received multiple awards for her research, including the 2007 Award for Distinguished Contributions to Applications of Psychology to Education and Training, and the 1998 E.L. Thorndike Award (both from the American Psychological Association), as well as the 1999 Oeuvre Award from the European Association on Research for Learning and Instruction. Dr. Resnick has conducted research and written widely on the learning and teaching of literacy, mathematics, and science. Her recent work focuses on school reform, assessment, effort-based education, the nature and development of thinking abilities, and the role of talk and discourse in learning. She is founder and Director of the Institute for Learning, which bridges the domains of research and practice by convening to educators the best of current knowledge about learning processes, principles of instruction, and the design of school systems. She co-founded the New Standards Project (1990-1999), which developed performance-based standards and assessments that widely influenced state and school district practice. Dr. Resnick is a prolific author and respected editor in addition to serving on many national education boards, commissions, and associations. Her National Academy of Sciences monograph, Education and Learning to Think, has been influential in both research and school reform efforts, and her widely circulated AERA Presidential Address, Learning In School and Out, has shaped thinking about learning and teaching in both formal and informal settings. Dr. Resnick has worked to link educational research to critical issues of education policy over the course of her career. She is the founding editor of Research Points, a brief for education policymakers published by AERA, was advisor to the first chairman of the National Education Goals Panel, and was a member of the National Council on Education Standards and Testing, the governing body that launched the nation’s standards policy. More recently, Dr. Resnick has been Chair of the National Academy of Education White Paper Project, an initiative to connect policymakers in the current Presidential administration and Congress with the best available evidence on selected education policy issues. * The FABBS Foundation would like to thank Drs. Arthur Graesser and Nancy Israel for nominating Lauren Resnick for this honor and for leading the effort to spread the word about her nomination. Would you like to honor Lauren Resnick? It isn’t too late to have your name added to the list of donors! You can make your donation to Lauren Resnick’s In Honor Of… campaign at anytime.